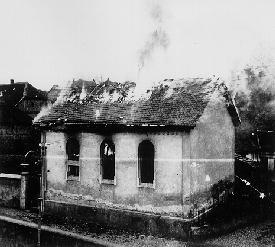 A synagogue burns in Ober Ramstadt during Kristallnacht. 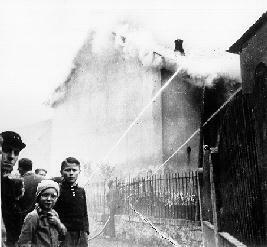 Right: Young onlookers watch as the local fire department prevents the fire from spreading to nearby houses, but makes no attempt to stop the synagogue from burning. A massive, coordinated attack on Jews throughout the German Reich on the night of November 9, 1938, into the next day, has come to be known as Kristallnacht or The Night of Broken Glass. The attack came after Herschel Grynszpan, a 17 year old Jew living in Paris, shot and killed a member of the German Embassy staff there in retaliation for the poor treatment his father and his family suffered at the hands of the Nazis in Germany. On October 27, Grynszpan's family and over 15,000 other Jews, originally from Poland, had been expelled from Germany without any warning. They were forcibly transported by train in boxcars then dumped at the Polish border. For Adolf Hitler and Propaganda Minister Joseph Goebbels, the shooting in Paris provided an opportunity to incite Germans to "rise in bloody vengeance against the Jews." On November 9, mob violence broke out as the regular German police stood by and crowds of spectators watched. Nazi storm troopers along with members of the SS and Hitler Youth beat and murdered Jews, broke into and wrecked Jewish homes, and brutalized Jewish women and children. All over Germany, Austria and other Nazi controlled areas, Jewish shops and department stores had their windows smashed and contents destroyed. Synagogues were especially targeted for vandalism, including desecration of sacred Torah scrolls. Hundreds of synagogues were systematically burned while local fire departments stood by or simply prevented the fire from spreading to surrounding buildings. About 25,000 Jewish men were rounded up and later sent to concentration camps where they were often brutalized by SS guards and in some cases randomly chosen to be beaten to death. The reaction outside Germany to Kristallnacht was shock and outrage, creating a storm of negative publicity in newspapers and among radio commentators that served to isolate Hitler's Germany from the civilized nations and weaken any pro-Nazi sentiments in those countries. Shortly after Kristallnacht, the United States recalled its ambassador permanently. In Germany, on November 12, top Nazis, including Hermann Göring and Joseph Goebbels, held a meeting concerning the economic impact of the damage and to discuss further measures to be taken against the Jews. SS leader Reinhard Heydrich reported 7500 businesses destroyed, 267 synagogues burned (with 177 totally destroyed) and 91 Jews killed. Heydrich requested new decrees barring Jews from any contact with Germans by excluding them from public transportation, schools, even hospitals, essentially forcing them into ghettos or out of the country. Goebbels said the Jews would be made to clean out the debris from burned out synagogues which would then be turned into parking lots. At this meeting it was decided to eliminate Jews entirely from economic life in the Reich by transferring all Jewish property and enterprises to 'Aryans,' with minor compensation given to the Jews in the form of bonds. Regarding the economic impact of the damage from Kristallnacht and the resulting massive insurance claims, Hermann Göring stated the Jews themselves would be billed for the damage and that any insurance money due to them would be confiscated by the State. "I shall close the meeting with these words," said Göring, "German Jewry shall, as punishment for their abominable crimes, et cetera, have to make a contribution for one billion marks. That will work. The swine won't commit another murder. Incidentally, I would like to say that I would not like to be a Jew in Germany."